NICK is a modern Christmas story. The story of a boy named Martin, who always loses at sled races. 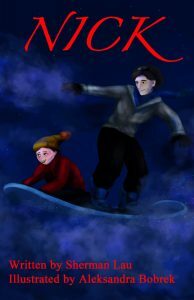 Until one night, when he meets a mysterious magical friend, named Nick. His sled is given magical powers and his life is forever changed. He and friends embark on an incredible adventure with Nick that takes them to opposite ends of the world. They meet fantastical new friends, battle dangerous creatures and overcome treacherous traps. Along the way, he and Nick learn to believe in themselves, each other and the magic of Christmas. The book is being developed by the producer of the Oscar winning film, ARGO for a feature film. Sherman Lau is an award winning filmmaker and television producer. His work has appeared on MTV, VH1, Discovery Channel, TLC, TruTV, History Channel, Bravo, National Geographic, PBS, Netflix and Nickelodeon. This is his first childrens book. He lives with his wife and two sons in New York.